find stuff for free (on the side of the road) and use it! I haven’t been here for ages, and I have been feeling sad about it. But seriously, I have overcommitted to life-things and am having trouble fitting all my loves in. A brief update, and a disclaimer for future posts. I have been working at Alphington Community Centre and filling in as Coordinator (which I ❤️). I am also doing a visual arts course called CREATE at NCAT on Thursday and Friday (which I ❤️). I have been regularly crafting with the Craft Club chicks for the FPS fair (held last Saturday). We made ace stuff this year. I have been collecting mountains of fridge boxes to make a 📦 maze at said fair. It too was ace! But last night I was at Elise’s showing her all the things I have been painting in the CREATE course that I am doing. And she said I should write about them here. And I thought about it. And in the end this blog is about me, and it’s dumb not to write, right, just because I am not consumed in second hand consumption … right? So, I hope you enjoy the 6 month interlude that is about to befall you as I share my arty journey (with just a touch of second hand stuff thrown in). At kinder each of my kids liked nothing more than threading. Week after week they came home with beautiful threaded creations. And I kept most* of them. And used them to make this fab. mobile/dangle art. If your kids are in to threading you could make something like this too! Just get a stick out of the garden, hang the creations on it artistically (I made our dangles longer by joining multiple ‘projects’ together) and then hang it with fishing line. Easy and cute. And a great memory of fun kinder years. *when I say most, actually I mean a few each. You know, I used to live off Smith Street, on Otter Street (the main drag between the housing commission high rise on Wellington Street and Safeway). 20 years ago it wasn’t the most salubrious of neighbourhoods. If we didn’t have people kicking our door in (really, we came home and the front door was on the floor) and robbing our house while we were asleep (we did leave the back door open on a hot night), or stealing furniture off the porch, and strangers climbing over the fence to fill plastic bags with the plums from the tree in our backyard when we weren’t home, it would have been ace. Actually it was ace – despite all this. Who doesn’t have fun hanging with their friends in their first student house? Back then Smith Street already had the great asian bakery opposite Safeway, the galleries down the city end, the dodgy chicken shop (we could just afford the Tuesday 1/4 chicken and chips deal on our Austudy allowance), the organic shop, Jonathan’s (the flash butchers) and a nice selection of op shops and $2 shops catering to our meagre budgets. And just as we left the scene started to change – Gluttony opened. Wow, a cool cafe. Maybe it would become the new Brunswick Street? 1. I was super excited to see these impressive hung planters made out of …. twigs and twine just like my star. A bit more tying involved here I think, but still. It made me feel a little bit like I knew what was going on – you know? 2. Seeing Kirra Jamison’s work in real life. I can see why Lucy (Design Files) is always pointing it out in houses. It is quite something in the flesh. 3. These chopping boards – really and truly, ever since I made salad servers I have been envisaging ‘dipped’ chopping boards. Treehorn Design beat me to it … but it was a good idea huh? And truth be known I would have made, like two, and then moved on to the next project. They look cool as. 4. And I am very glad I made my own terrarium (thanks Wendy) – terariums are clearly the go and everyone should have one in 2014! 5. These bats. Love a bit or recycled art. I took photos of some like this at Melbourne Art Fair this year … I wonder if these are by the same person? These ones have a bit more on them, so maybe not? I forgot to look who the artist was. 6. Works by Elizabeth Barnett (she was one of the feature artists at Art4All this year). And then, I walked along Smith Street and found …. 1. A sign calling to me … And I went inside and found this paper. Love it. 3. Port Jackson Press – so many great works – Kyoko, Damon, Rona, Martin, Dean. I could have bought everthing there. I might go back for a little something for Clive for Christmas. 4. A book/art/design/homewares shop (super combo) back up near Otter Street. Called Happy Valley. I just want to point out that I got my $85 grey cross Pony Rider cushion at the Brunswick Brotherhood for $3. And bugger, I left the acidic yellow one there (what was I thinking). And, also, what do you think … I might need some copper spray paint ASAP. I found two planters like this in hard rubbish. Don’t they look good in copper. 5. And finally, I popped in to Tanner and Teague and saw this advent calendar. Which the lady in the shop told me they made as part of a workshop event they held upstairs a couple of weeks ago. Hmm. I’d like to go to a workshop and come away having made something like this. And I ate delicious rice paper rolls as I walked along (from my old haunt the asian bakery). And had a great Seven Seeds coffee and a chat with the barrista at the open house (nice). And got back to my car in the Safeway carpark within the allotted 1.5 hours (the City of Yarra parking inspector had marked my tyres – so lucky I believed the sign about car parking limits being enforced). Maybe you should take a stroll there too. The Design Files Open House at 12 Smith Street is open til Sunday from 10am to 5pm. Welcome to Melbourne, Victoria. Home to one enthusiastic second hand shopper (that's me). 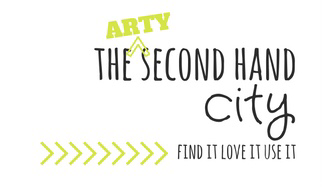 Second hand is environmentally friendly, fun, inspiring, thrifty, interesting and generally good for the soul. Join me as I shop, find, use, recycle, reinvent, repurpose and love all things not quite new! Oh ... and you might find some recipes here – that’s because I like cooking. And occasionally some stuff about the rest of my life (because sometimes I do other things too).